Well, if reports from an airport delay last weekend are anything to go by, Keanu Reeves at least is one of the good ones. As documented in a tweet by game developer Amir Blum and an Instagram story by artist Brian Rea, a group of passengers, including Reeves, landed in Bakersfield, California during a trip from San Francisco to Los Angeles. The emergency landing was carried out safely, but the group aboard the flight were left trying to figure out how to complete the last leg of their journey to L.A. A Twitter user with the slightly biased @keanusgf account name, preserved Rea’s Instagram clips in a wonderful audiovisual record of what followed. Assuming the role of baseball cap-wearing parent to an airport terminal of his adopted children, Reeves breaks down the travel situation, explaining that a bus could take them all to their destination. The next thing we see is a shot from inside the vehicle, Reeves reading out Bakersfield facts (it’s the “ninth most populous city in California and the 52nd most populous city in the nation!”) and playing some twangy, smartphone-speaker country music for his new friends. (Rea’s post quotes this as “Bakersfield Sound,” hopefully indicating that this was Reeves’ description of the genre.) Later, we learn that Reeves has some water, a banana, and Gatorade with him, and we get to listen to him bid a friendly farewell to a fellow passenger before walking off into this story’s version of the sunset: a Carl’s Jr. parking lot. Another cut collecting Rea’s shots and videos was tweeted by Ari Saperstein, which you can watch as well if you’d like more blurry photos and videos of the actor doing normal guy stuff and shepherding his flock to Los Angeles. This latest story, which many PR people would pay very good money to orchestrate, is only the most recent version of Reeves being consistently endearing. 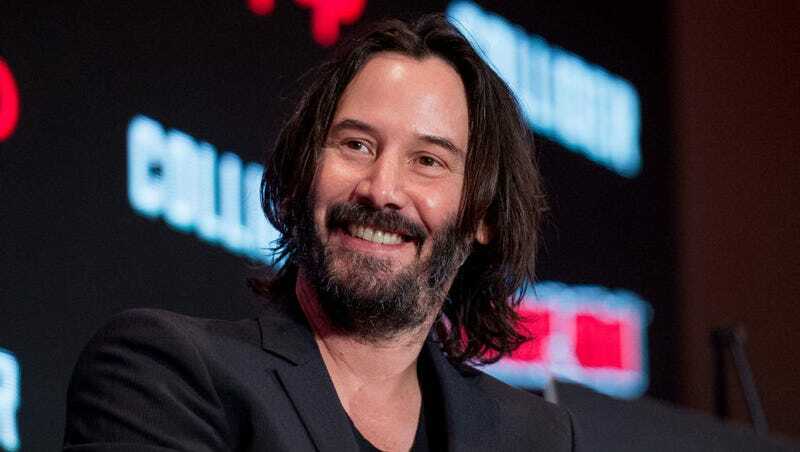 Whether he’s hanging out with Dolly Parton or losing his cool meeting Sonny Chiba on live TV, Reeves just sort of seems like a good dude who happens to have also played John Wick and Neo in a bunch of popular movies. All in all, and not that the competition is too fierce, he seems like the best choice when it comes to airplane-related celebrity encounters.